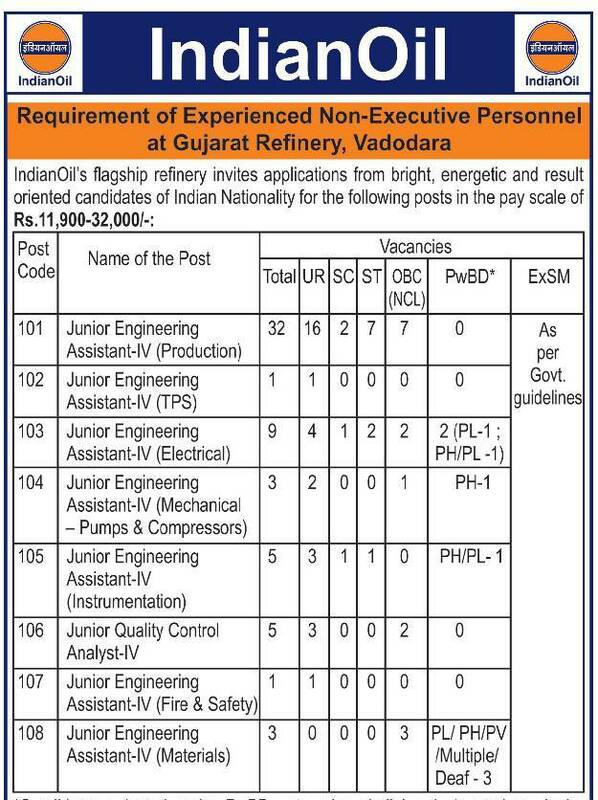 Indian Oils Flagship refinery Invites Applications from bright, energetic and Result oriented candidates of Indian Nationality for the Following post in the pay scale of Rs.11900-32000. The date for the purposes of possenssion of experience, qualification and meeting age criterial shall be 28-02-2018. How to Apply: Interested and Eligible Candidates may Apply Online Through Official Website https://www.iocl.com go to “What’s New” >> Click on Requirement of Experienced Non Executive Personnel 2018 in IOCL, Refineries Dvision. All future communication with candidates will take place only throught website / email /mobile phone. Please note that only online mode of application will be accepted, falling which candidature will not be considered.